First introduced at the 1971 Geneva Salon, only 571 Bora’s were ever made when production of this model ended 1979. 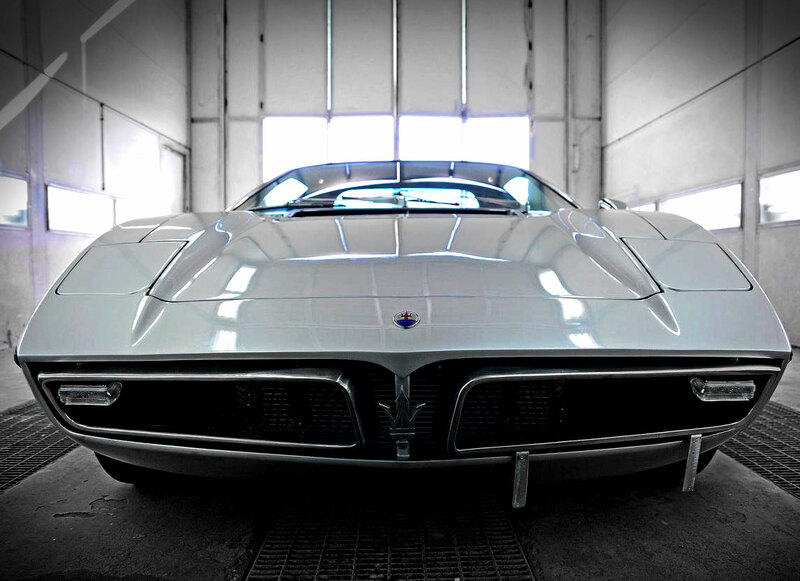 “The Maserati Bora is a mid-engined Maserati two-seat coupe powered by a V8 engine. Produced from 1971 to 1978, it has a top speed of 171 miles per hour (275 km/h). From Bonhams: The highlight of 1971 Geneva Salon was undoubtedly the sensational new Maserati Bora. With the Bora’s introduction, the great Modenese manufacturer followed other supercar constructors in going mid-engined, while at the same time abandoning its traditional tubular chassis technology in favour of unitary construction. Named after an Adriatic wind, the Bora was the work of Giorgetto Giugiaro’s Ital Design, at least as far as its bodyshell was concerned; the mid-mounted engine was Maserati’s familiar four-cam V8 in 4.7-litre form, the five-speed transaxle came from ZF and the all-independent double-wishbone suspension was penned by Giulio Alfieri, co-designer of the legendary 250F Formula 1 car.